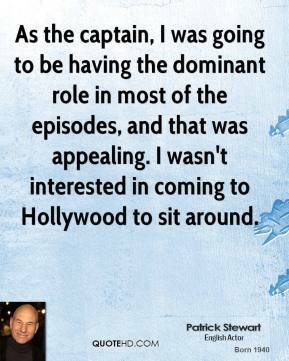 As the captain, I was going to be having the dominant role in most of the episodes, and that was appealing. 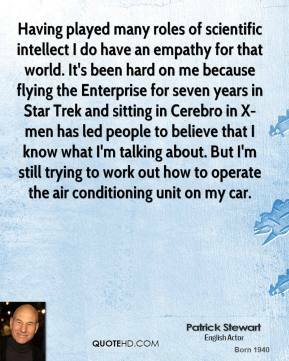 I wasn't interested in coming to Hollywood to sit around. 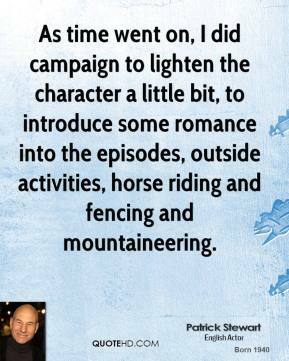 As time went on, I did campaign to lighten the character a little bit, to introduce some romance into the episodes, outside activities, horse riding and fencing and mountaineering. 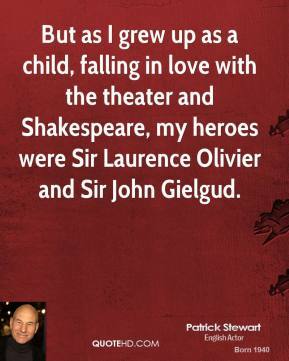 But as I grew up as a child, falling in love with the theater and Shakespeare, my heroes were Sir Laurence Olivier and Sir John Gielgud. 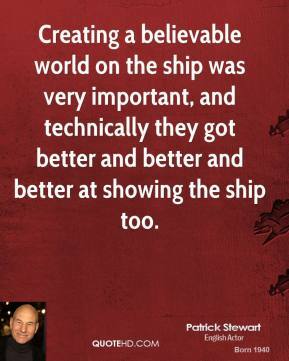 Creating a believable world on the ship was very important, and technically they got better and better and better at showing the ship too. 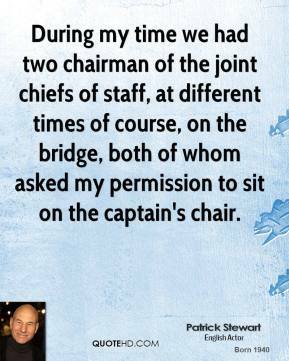 During my time we had two chairman of the joint chiefs of staff, at different times of course, on the bridge, both of whom asked my permission to sit on the captain's chair. 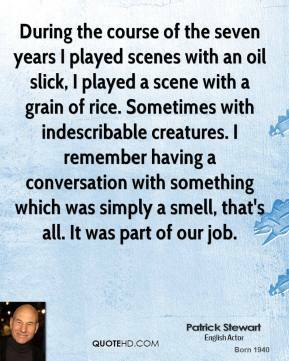 During the course of the seven years I played scenes with an oil slick, I played a scene with a grain of rice. Sometimes with indescribable creatures. I remember having a conversation with something which was simply a smell, that's all. It was part of our job. 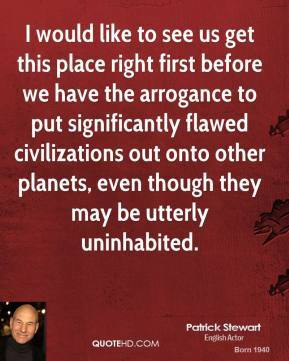 Encouraging people to believe in it was the most important thing of all. 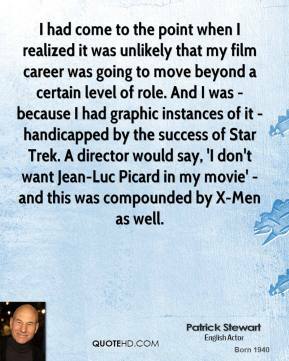 It's one of the reasons I was always uncomfortable whenever film crews came on the set to shoot things. I didn't want our make-believe to be exposed. 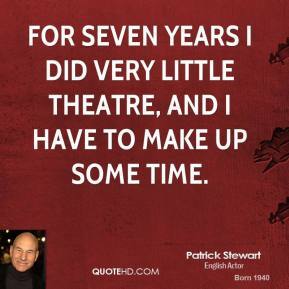 For seven years I did very little theatre, and I have to make up some time. 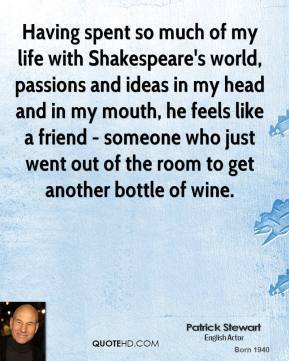 Having spent so much of my life with Shakespeare's world, passions and ideas in my head and in my mouth, he feels like a friend - someone who just went out of the room to get another bottle of wine. 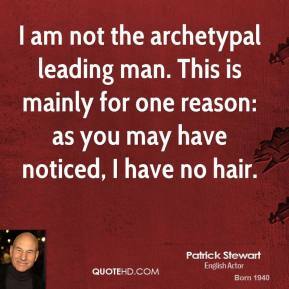 I am not the archetypal leading man. This is mainly for one reason: as you may have noticed, I have no hair. 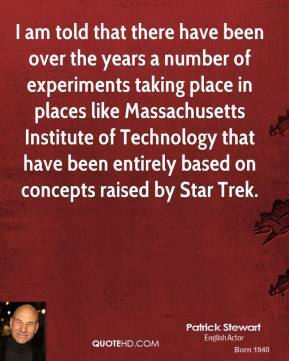 I came to feel very, very sentimental about those sets, which is ludicrous, because they represent everything which is transitory and insubstantial. 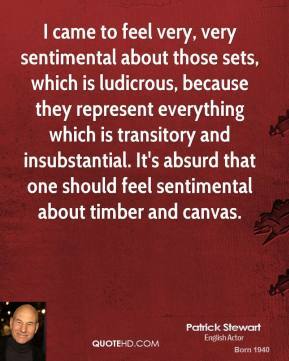 It's absurd that one should feel sentimental about timber and canvas. 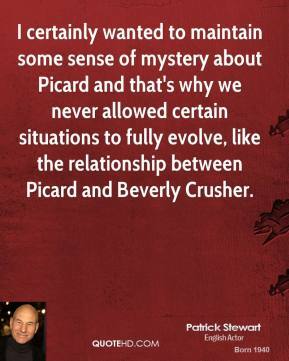 I certainly wanted to maintain some sense of mystery about Picard and that's why we never allowed certain situations to fully evolve, like the relationship between Picard and Beverly Crusher. I don't do impersonations. I can do a wounded elephant! I can do a really good cow! And because of the amount of time I spent in North Yorkshire, I do a variety of sheep. All of which I will be happy to roll out for you! I never had teenage years. 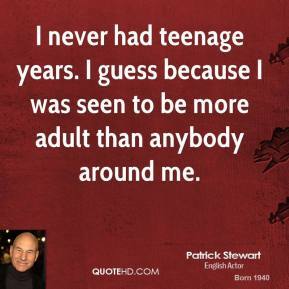 I guess because I was seen to be more adult than anybody around me. I think I came back from America a funnier and nicer person than I went. 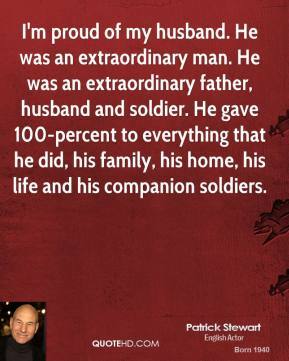 I was brought up in a very poor and very violent household. 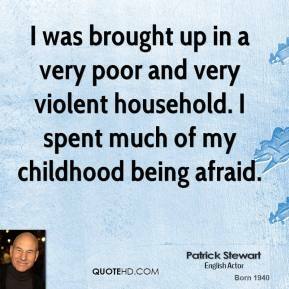 I spent much of my childhood being afraid. I wasn't campaigning for a role in a Hollywood television series, it was a fluke. So you've got to have a measure of good luck, you really have, being in the right place at the right time. 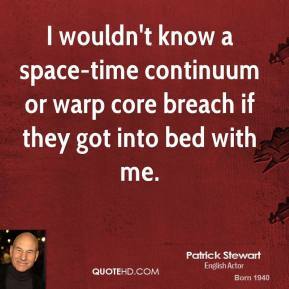 I wouldn't know a space-time continuum or warp core breach if they got into bed with me. 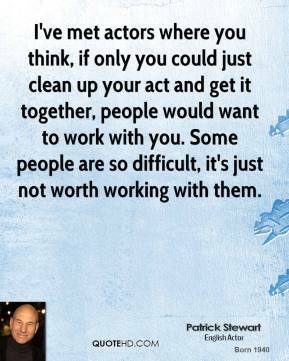 I've met actors where you think, if only you could just clean up your act and get it together, people would want to work with you. Some people are so difficult, it's just not worth working with them.